Nihon Shōkai (日本商会) was a Japanese camera distributor, already active in 1937. Its address from 1937 to 1944 was Nihonbashi-ku Dōri 2–4 in Tokyo (東京市日本橋区通り二ノ四). Many of the products distributed by Nihon Shōkai before 1945 were also jointly advertised by Honjō Shōkai. The company survived the war; in 1949 it was located at Bunkyō-ku Tōdai-seimon-mae (東京都文京区東大正門前), facing the main gate of the Tōdai university. 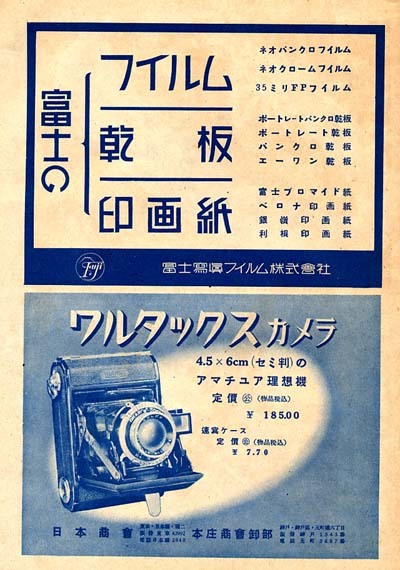 Nihon Shōkai sold a Walz camera in 1937 and various Walz accessories before and after the war; it was certainly the owner of the Walz brand name, and perhaps the predecessor of Walz Shōkai. ↑ 1.0 1.1 Advertisement in Asahi Graph, June 16, 1937, formerly reproduced at Gochamaze (archived). ↑ Advertisements reproduced in Kokusan kamera no rekishi, pp.58, 78 and 107, in Gochamaze (archived) and in Hyaku-gō goto jūkai no kiroku, pp.40 and 64. ↑ 3.0 3.1 3.2 3.3 3.4 Advertisement in Ars Camera February 1949, p.27. ↑ 4.0 4.1 Leaflet Waltax 4.5 / 6, c.1940. ↑ Advertisement in Hōdō Shashin April 1942, reproduced in Kokusan kamera no rekishi, p.107. ↑ Advertisement dated 1942 reproduced in Nostalgic Camera by Toshio Inamura. ↑ advertisement in Asahi Graph, March 3, 1943, formerly reproduced at Gochamaze (archived). ↑ 8.0 8.1 Advertisement on the second cover of Nihon Shashin Kōgyō Tsūshin, February 15, 1944, reproduced on p.64 of Hyaku-gō goto jūkai no kiroku. ↑ Advertisement in Hōdō Shashin May 1943, reproduced in Kokusan kamera no rekishi, p.78. ↑ Advertisement in Hōdō Shashin March 1942, formerly reproduced at Gochamaze (archived) and reproduced in Kokusan kamera no rekishi, p.58. ↑ Advertisements published in the December 1941 and March 1942 issues of Hōdō Shashin, reproduced in Kokusan kamera no rekishi, pp.58 and 60. ↑ 12.0 12.1 Advertisement in Asahi Graph, December 22, 1943, formerly reproduced at Gochamaze (archived). ↑ 13.0 13.1 13.2 Advertisement on p.6 of Nihon Shashin Kōgyō Tsūshin, December 15, 1939, reproduced on p.40 of Hyaku-gō goto jūkai no kiroku. ↑ 14.0 14.1 14.2 Advertisement on p.3 of Nihon Shashin Kōgyō Tsūshin, April 20, 1948, reproduced on p.81 of Hyaku-gō goto jūkai no kiroku. ↑ Noma, p.71, attributes this accessory to "Walz". Ars Camera. Advertisement by Nihon Shōkai in February 1949 (p.27). Nihon Shashin Kōgyō Tsūshin (日本写真興業通信). Hyaku-gō goto jūkai no kiroku (百号ごと十回の記録, Ten records, every hundred issues). Tokyo: Nihon Shashin Kōgyō Tsūshin Sha (日本写真興業通信社), 1967. No ISBN number. Advertisements on p.40, corresponding to p.6 of the December 15, 1939 issue, on p.64, corresponding to the second cover of the February 15, 1944 issue, and on p.81, corresponding to p.3 of the April 20, 1948 issue. This page was last edited on 17 January 2018, at 11:35.